Jil Jung Juck is surely an over rated movie in spite of the new young team and this is mainly because of its uniqueness and a trendsetter in Tamil Cinema. This film has impressed everyone right from its Teaser, Trailer and Songs. This film also marks Siddharth’s second film as a producer. 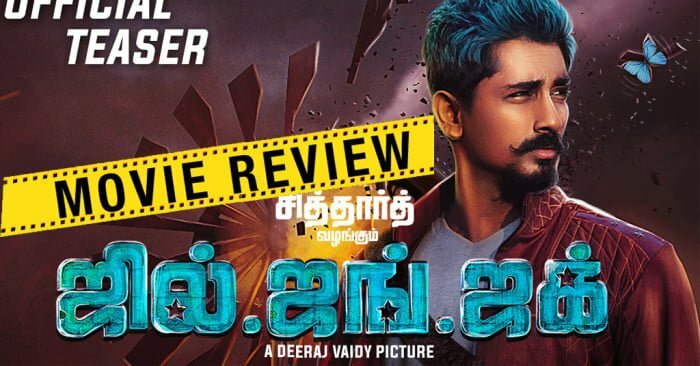 Jil Jung Juk is a story about the three characters and their journey towards a target with black comedy theme.The movie as touted was a black comedy genre. Siddharth as Nanjil Shivaji (Jil), Avinash Raghudevan as Jungulingam (Jung), Sananth Reddy as Jaguar Jagan (Juck) were assigned a simple task of transferring cocaine. The job of taking the candy pink car to Hyderabad and hand it over to the waiting Chinese mafia is given to three conmen Jil (Siddharth) Jung (Avinash Raghudevan) and Juk (Sananth). What follows is a hilarious macho ride that keeps audiences in splits right until the very end. The lead characters are the backbone of the movie. Their facial expressions itself lighten up the whole screen. RJ Balaji appears for few minutes. But still he makes an impact. Veteran actors Radharavi and Naasar prove their mettle. Siddharth proves his versatility once again. Cinematographer Shreyas Krishna deserves a pat on his back for setting the mood with the right play of lights and movements. BGM is another high point for the movie, especially at the fight sequence, a classical bit is too good. Editing is not sharp enough which is a big let down for the movie. VERDICT: Jil Jung Juk falls under “JUNG” Category. Jil Jung Juk Review Jil Jung Juk falls under "JUNG"
worst story. time waste. money waste and petrol waste. stupid story.